In today’s episode we look at some of the work done by the Senseable City Lab. 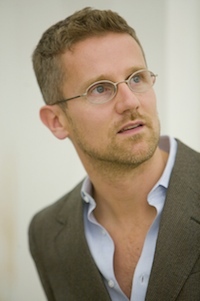 We’ll be talking to Carlo Ratti, the director of the Lab, about two of the Lab’s many projects – namely Flyfire and Seaswarm. As well as being a regular contributor to the architecture magazine Domus and the Italian newspaper Il Sole 24 Ore, Carlo has written for the BBC, La Stampa, Scientific American and The New York Times. His work has been exhibited worldwide at venues such as the Venice Biennale, the Design Museum Barcelona, the Science Museum in London, GAFTA in San Francisco and The Museum of Modern Art in New York. His Digital Water Pavilion at the 2008 World Expo was hailed by Time Magazine as one of the ‘Best Inventions of the Year’. Carlo was recently a presenter at TED 2011 and is serving as a member of the World Economic Forum Global Agenda Council for Urban Management. He is also a program director at the Strelka Institute for Media, Architecture and Design in Moscow and a curator of the 2012 BMW Guggenheim Pavilion in Berlin. Carlo founded the Senseable City Lab in 2004 within the City Design and Development group at the Department of Urban Studies and Planning, in collaboration with the MIT Media Lab. The Lab’s mission is to creatively intervene and investigate the interface between people, technologies and the city. Whilst fostering interdisciplinary, the Lab’s work draws on diverse fields such as urban planning, architecture, design, engineering, computer science, natural sciences and economics to capture the full nature of urban problems and deliver research and applications that empower citizens to make choices that result in a more liveable urban condition.